Whenever someone posts something in the comment section that is thoughtful and well-considered, I like to elevate it to an actual post; that way the message doesn't get lost in the shuffle. I am still puzzled as to why the domaining community has waited so long to act; the warning signs were certainly there. It seems a bit late to declare war on a bill that is sure to be popular with constituents. This is my first time posting on your blog although I do frequent your blog from time to time. I was compelled to share my thoughts here because of the obvious passion that you displayed on the Snowe Bill issue. I think you have said perhaps what a lot of folks are thinking or asking themselves. . . who really are the threatened ones here? Who really has the most to lose? For me, I am still in my honeymoon phase of domaining. Although, I would hate to see this thing end right at the time that I decided to dive in at the deep end of the pool . . . ultimately, what can you do? Nevertheless, for what it is worth, in my final analysis, I believe that the proposed legislation will not pass as presently written, especially if every domainer under the sun begins to shoot his/her opposition of the Bill to their respective congressmen and women in Washington ASAP. I don't believe that the Snowe Bill will make it beyond the floors of Congress because it seems to me that in an already rocky and shaky economy, the Snowe Bill if it is ratified by Congress would have an effect so rippling and slippery that it would prove untenable for business, and the gains of trade. Quite simply, it seems to me that the passage of the Snowe Bill would have the potential to rock the publicly-traded domain companies. The trickle-down effect bourne out of this would then reverberate into the public and financial community in a manner similar to the current mortgage crisis, although perhaps on a smaller scale--but still quite damaging. Imagine if you will, "EveryDay Joe" who buys shares of Communicate.com, NameMedia, and other publicly-traded domain companies--not only would Domainers lose out, but also other stakeholders (i.e., Banks/financiers, etc) who are heavily invested. The passage of this ill-conceived and self-interested Bill would be almost Enronian in its effect and application, and I for one just don't see those Senators and Representatives ratifying a bill that will send the economy into further descent, and tailspin this time around. The impact would most likely put a lot of folks out of work and further disturb an already shaky economy. In any case, I, too was also amazed at the costs involved in becoming a member of ICA, and have not joined because of the costs. However, I do plan to join the ICA when I start making some real money off of some domain sales. Through my nine-month observation of the domain industry, I definitely can see a very developed domain caste system that exists between the "domain-haves" and the "domain-havenots." One can read about it almost everyday when a "have" says that any domain extension other than .Com is garbage. This socially constructed domain stratification, says you are only a player if you were blessed, fortunate or lucky enough to get into the domain game 10+ years ago. Ironically, its almost collusive by nature if one sits back and really observes the domain dynamics at play. And yet, isn't this the American way--free enterprise, etc., etc. We have to remember that this industry is just a microcosm of larger society--same ailments and the same rewards. Nevertheless, to digress a bit: a few weeks ago, I suggested via email to an ICA Board Member that the organization consider offering membership through domain donation. Essentially, a domainer could join ICA by tendering a domain or domains equivalent to the relevant value of the membership interest. At that time, I intimated that the cost factor to join the ICA might be more of an impediment to increasing the ICA membership numbers and coffers. I suggested that in lieu of the relevant membership fee, that a prospective member be afforded the opportunity joint ICA by donating a domain or domains equivalent to the level of membership sought by the individual. Subsequently, ICA could then pool the donated domains for auction to help generate the revenue necessary to support ICA membership in defending against institutional and public legal attacks. At the time, I thought this was a reasonable and feasible idea if not acceptable to the ICA Board . . . to date, I haven't heard a peep back about this in the domainersphere although I thought it might be discussed at the most recent ICA meeting. Nonetheless, at this time, I don't think that Domainers should reinvent the wheel here, but rather I submit that serious domainers should at the very least try to form and present a very real and unified front regarding the Snowe Bill. However, if in fact, the chasm between the established, intermediate and upstart domainers is really too wide a gap to bridge, then perhaps a second organization may need to be formed. At present, I am warm to this idea, but if left with no other viable options, spambait's prior suggestion maybe right. Finally, if the Snowe Bill did get passed, wouldn't big companies like GoDaddy, Oversee/Moniker, NameMedia, and all other domain stakeholders lose a small fortune because many registrars also hold their own private portfolios? I am definitely not an economist, but I just don't see this Domain Apocalypse happening--at least not on the scale that is being proffered. Is the threat real? Yes, very real, but everyone is dirty in this game from what I can see. Perhaps the "Haves" for resting on their laurels for too long; smaller stakeholders for sitting on their hands too; and the politicians for inadequately protecting the rights of domain registrants in the first place. Anyway, as I said before--maybe I am just naive regarding these issues. P.S. Daryl, if you would like full credit for your post, please let me know, and I will update this post. However, I understand why you might want to remain anonymous. By the way, the above domain illustrated above could be available for a "havenot" domaining organization; I had planned to redirect it to my site It's JUST War! , but plans can change. Wow, I certainly didn't expect you to feature my thoughts on your Blog; however, I am flattered, and humbled by the gesture. When my eyes opened this morning from a decent's night sleep, the first thing that came to my mind was what I wrote in that post to you. I looked for the retrieve blog post button, but it was much too late for that. Yes, I think it is war. ItsWar.Org is great--I love it--wish I had thought of it too! I think it is time for ICA and the entire domain industry to start doing some lobbying of its own in Washington. As I alluded to in my previous post, the current laws do not fully protect Domainers, and they should. I had been thinking about writing an article entitled "Just Who Is This Guy Cyber and Just What Is He Squatting?" The motivation for writing this article came about a month ago when a very good friend of mine who sought my services in identifying a name for his start-up. He shared that the name that he attempted to register was being held by a "squatter" rather contemptously. It was clear that anyone that sought to protect their idea or concept was a "Squatter" to him--me included. Although he didn't refer to me as a "Squatter" to my face. Nevertheless, my article was going to discuss the dichotomy between historic real property development vs. cyber real estate development to demonstrate that this whole "Squatter" epithet is nothing more than a faulty and flawed comparison. Under the traditional American property regime, "Squatters" as I understand the concept, were those who somehow managed to takeover the real property owned by another person, by openly living on the property and treating it as his own. Of course the true owner always seem to live somewhere else during the "Squatters" takeover. Yet,if in fact this is the case, how does it really follow that anyone other than a person that registers a previously Trademarked domain meets the definition of a "Squatter?" This is why this whole "CyberSquatting" concept should have never been allowed to overreach into the general domainer populace, and lexicon. Now we have CADNA, and other domainjackers trying to jack all of our domains. To these uneducated people, we are all "CyberSquatters." In any case, I believe that we are all the rightful owners of our respective domains because we hold title to them--we registered them. Ergo, it is impossible for a legally bonafide domain registrant to ever be a real "CyberSquatter." Anyone who thinks otherwise is just plain ignorant of the true definition of the term "CyberSquatter." Is there a cyberspacelawyer in the house? Think about it Patent, Trademark and Copyright registrants all get a limited license to their intellectual property. Domain Registration should be the same way--without reproach--assuming of course, that the registration was made in good-faith. From what I know about you, you are a writer; I am a poet when I find the motivation to poet. When I registered my poetry compilation 10 years ago with the Library of Congress--no one could challenge my good-faith registration (copyright) because the common law copyright in the work vested as soon as I put pen to paper. Similarly, the trademark registration process although it is a bit more lengthy, and more complicated, affords registrants more protection, once the registration gets through the opposition phase--the TM is essentially the registrants for a period of years. Domain Registrations should be the similar to the rights afforded through the Copyright process--there shouldn't be a use it or I'll contest it proposition involved at all. The early bird does in fact still get the worm, and that's why there are multiple extensions, so that domain registrants will have other options if option 1 (.Com) is gone. Instead, the American way seems at times to be: "She has it, I want it or need it--so, I am taking it by any means necessary." Thanks for yet another thought-provoking comment; I love the title "Just Who Is This Guy Cyber and Just What Is He Squatting?" It would be a great article, targeted to people like my aunt and uncle. I have a question for you, but I'd like to ask it privately. I'm glad that there isn't a delete button on comments. Thank you for voicing your concern about the Snowe bill. There is some risk that this bill will pass if we don't get enough people writing their Senators. We will accept your domain name donations and credit 100% of the auction price to an Internet Commerce Association membership. 1. 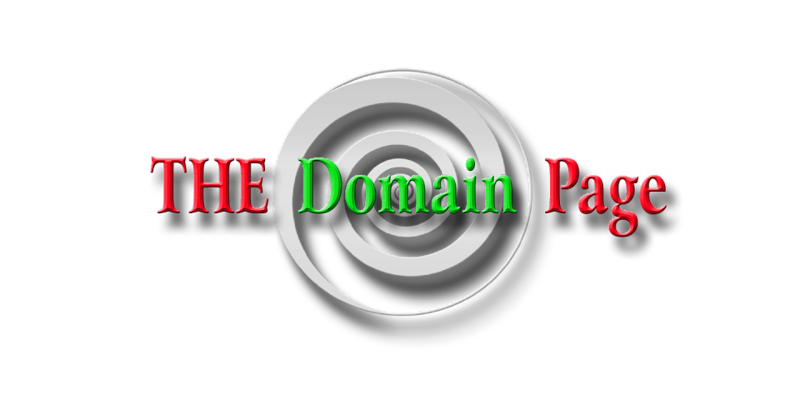 Although the owner of THE Domain Page offers a lot of opinions about domaining, she is not an expert; therefore, she cannot be held responsible for monetary losses incurred from the advice offered here. 2. Sometimes a blog is just a blog.